The purpose of this paper is to discuss from a historical point of view the classical Rankine-Hugoniot (RH) relations in more detail than usually done in standard textbooks. 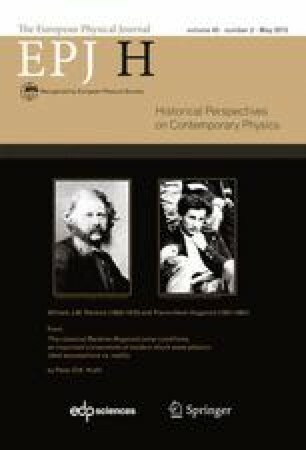 Particularly focusing on the last seventy years, this paper (i) reviews their validity and limitations as interpreted by numerous users; (ii) summarizes their enormous extension also to other branches of science and engineering; and (iii) discusses the nontrivial problem of error estimation. Originally, the RH relations were derived for a plane-parallel steadily propagating aerial shock with a step wave profile; i.e., a wave with zero rise-time and constant thermodynamic as well as kinematic parameter values behind the shock front. But real shock waves are in most cases three-dimensional, have finite rise-times, and in almost all cases are unsteady waves. These real properties must produce a systematic error when applying the RH relations and the cardinal question arises how large this error will be in comparison with a random error caused by the applied high-speed diagnostics. However, numerical procedures of studying systematic errors of unsteady wave propagation are difficult to carry out because of various reasons and still pending. Dr. Krehl is a retired staff scientist from the Fraunhofer-Institute for High-Speed Dynamics, Ernst-Mach-Institut (FhG-EMI) at Freiburg/Breisgau, Germany. Rankine-Hugoniot jump conditions. Wikipedia; http://en.wikipedia.org/wiki/Rankine%E2%80%93Hugoniot_conditions. Multivariable calculus − Rankine-Hugoniot jump conditions derivation. Mathematics Stack Exchange; http://math.stackexchange.com/questions/865142/rankine-hugoniot-jump-condition-derivation. D.H. Weinberg, Astronomy 825: Radiative Gas Dynamics, Chap. 7: Shocks (Winter 2003). Dept. of Astronomy, Mathematical and Physical Sciences, Ohio State University; http://www.astronomy.ohio-state.edu/_dhw/A825/notes7.pdf. A. Bressan, Hyperbolic conservation laws – an illustrated tutorial (Dept. of Mathematics, Penn State University, University Park, PA (2009); http://www.math.psu.edu/bressan/PSPDF/clawtut09.pdf. Rankine-Hugoniot spreadsheets. Dewey McMillin & Associates Ltd., Victoria, BC V8N 2A4, Canada; see www.blastanalysis.com. I.V. Lomonosov, K.V. Khishchenko, P.R. Levashov, D.V. Minakov, A.S. Zakharenkov, J.B. Aidun, International shock-wave data base. IPCP and JIHT, RAS and SNL, USA; see http://www.ihed.ras.ru/elbrus12/program/restore.php?id=820. Shocks and discontinuities (magnetohydrodynamics). Wikipedia;http://en.wikipedia.org/wiki/Shocks_and_discontinuities_(magnetohydrodynamics). X.-B. Lin, Generalized Rankine-Hugoniot condition and shock solutions for quasi-linear hyperbolic systems. Dept. of Mathematics, North Carolina State University, Raleigh, NC (June 2, 2000); see http://www4.ncsu.edu/xblin/preprint/shock.pdf.